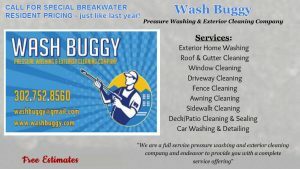 You may recall Washbuggy’s powerwashing visits here over the last several years and we’d like to come back with the same great offer for single-family and twin homes. Wash complete (double) TWIN HOME unit from roofline to ground. This means entire building; neighbors come together and both units of one building are done at the same time. Front porch and walkway included. Rear decks and porches are extra : $300 for twin /$525 for triple.